A couple of weeks ago I took my daughter to an exhibit on King Tut in the city. 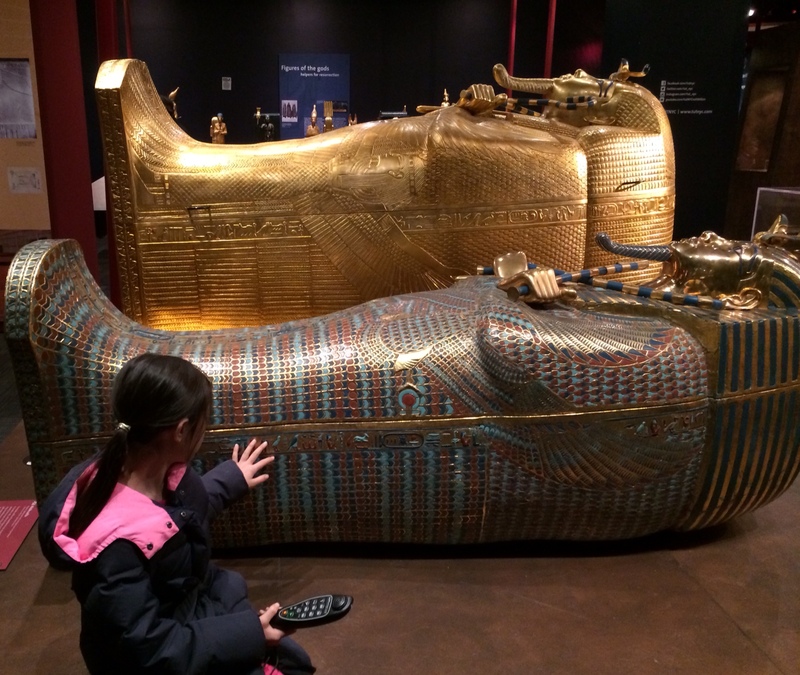 She had been learning about the Egyptian civilization this year, and I thought the exhibit, which created a life-size replica of King Tut’s tomb, would be a great visual for what she’d already learned. It was interesting for me as well, as I didn’t really know the story of how the tomb was discovered. It turns out, it was a story of perseverance- like many great discoveries. A man named Howard Carter was the archaeologist who finally found the tomb. He had been intent on finding it since he was a child and the Egyptian tombs first captured his imagination. He teamed up with and was financed by a wealthy English aristocrat named Lord Carnarvan, who just happens to have lived in the Downton Abbey castle. Carter had, I believe, six or seven areas in the Valley of the Kings where he was going to dig for the tomb, and for years he kept digging, finding- nothing. There was only one of those areas left when his financier was about to give up. That means that out of all of the areas he could have chosen to dig in, he chose the area where the actual tomb was last. But then just like that, after all of those years, a young worker hit upon something hard- a step…which led down to the intact, sealed tomb- just as it was left 3,000 years before. Carter persevered and he finally made his great discovery. Imagine, knowing what we now do, that he had given up after five or six years of digging in those other areas- not too far away from the real location of the tomb? He would have been so close…and yet so far away. We might also be close to that kind of treasure sometimes- often unbeknownst to us. But what if we give up right before we reach it? Audrey’s been really struggling with piano this year. Last year she was learning to play by ear and cruised through the first book. She and I both loved the ease of playing learning by this method, but eventually she became bored playing the same repertoire over and over each night at practice time. I felt like the reading part of music was missing, and she was ready for it. So, we switched methods and found a different teacher. I knew, though, it’d be a really difficult transition for her to go from listening to CD’s and then playing songs to reading- note by note. The level of musicality would feel like it was going backwards instead of progressing, and it has felt that way. She’s been frustrated, and her teacher is a bit of a perfectionist, and she’s already a perfectionist- so she hasn’t been feeling any sense of accomplishment even though she did learn to read. I was tempted to switch teachers again right away or even give up on piano altogether because I couldn’t take the nightly drama during practice time, but my mother in law suggested on Skype one Saturday morning that we stick it out and that sometimes you just have to get over the bump, and after that you’re stronger and better. This is the grit that is so highly touted today by psychologists as what it takes to really succeed. It’s also something I lacked, being one of those kids for whom many things came quite easily. When things have been easy and you come to a challenge, it feels like there must be some explanation- some other way around it. So, with the decision made that we would stick it out, I noticed her practicing getting better and more disciplined. I noticed also that during her “composing” times, new and strikingly beautiful things were coming out of her as I peered from our hallway without being noticed. Piano was becoming an important emotional outlet for her. How could we have even though about quitting? We’ve all heard of so many important or famous people who almost gave up on their dream but persevered. From Walt Disney and JK Rowling to Henry Ford and Bill Gates, the world is full of innovations and imaginative works that wouldn’t have been there if their creators had given up just a bit sooner than they did. Thomas Edison famously failed over 10,000 times to invent a commercially viable lightbulb but when he was asked if he felt like a failure or if he would give up, he replied, “Why would I feel like a failure? And why would I ever give up? I now know definitely over 9,000 ways an electric lightbulb will not work. Success is almost in my grasp.” It’s not just that we reach our goal by persistance, but we learn through our doggedness and failures- whether it be through process of elimination or by practicing until we have mastered something. “Success consists of going from failure to failure without loss of enthusiasm,” said Winston Churchill. “It’s not that I’m so smart, it’s just that I stay with problems longer,” said Einstein. At church a few weeks ago while I was thinking about all this, the pastor meditated on John chapter 21. It’s the third time the resurrected Christ appeared to his disciples. They had been fishing all night and caught nothing when they noticed a man on the shore. It was Jesus, but they did not recognize him- as was often the case after the Resurrection. He tells them, “Throw down your net on the right side of the boat and you will find some.” When they do this, they can barely haul in the net because it is so full of fish. After this, they recognize Him. Jesus says he’ll cook them the fish for breakfast and they drag over the net of 153 fish, “but even with so many the net wasn’t torn.” What if they had given up or refused to throw down their net as he suggested because, well, they’d already been trying all night. Not only would they have missed out on this tremendous catch- but they might just have missed out on the miracle of recognizing and seeing the man that they had seen crucified, alive again in the flesh- and shared an intimate, familial breakfast with him of bread and fish on the beach. It didn’t just take grit though for them to do that. It took faith, humility, and trust that maybe, just maybe, this stranger telling them to try again, knew something that they didn’t. Before I can discard the verse, I have to write it… I can’t discard a verse before it is written because it is the writing of the verse that produces whatever delights or interests or facets that are going to catch the light. The cutting of the gem has to be finished before you can see whether it shines, he said. That really is quite an investment to make, with very little certainty of return. But then again, doesn’t everything really worth discovering merit that inherent risk? Every book or long piece of writing begins with the idea. It may seem brilliant, but it must be fully worked through before the writer can really tell if it’s going to be any good. Every fisherman sets aside hours to make their catch, guaranteed nothing. The archaeologist Howard Carter had invested thousands of dollars, the work of many laborers, and years of his life in the discovery of Tut’s tomb, but he was promised nothing. Still, he had to see it through. Sometimes, as Harriet Beecher Stowe says, just when you feel like giving up, is just when the tide is about to turn. After Audrey stuck with her nightly piano practice for a few more weeks, I noticed a shift in both her discipline and creativity. I heard beautiful things that I hadn’t heard before coming out of her fingers. She had gotten over the bump and she had grown. I really think in your case you’re not giving up, but transitioning and taking the opportunity that life seems to be pointing at you…I’m 100% behind that! My daughter switched from Suzuki to traditional method this year too and we experienced similar frustrations in her as you described in Audrey. She is starting to turn the corner too but I agree wholeheartedly that perseverance is so crucial to wonderful discoveries. That is what I hope she learns most of all in her practices. Lifelong learning to wonderful discoveries! That’s funny- yes, we did Suzuki as well. It’s a bit of a rough transition, but I think overall it was still good to start with the ear playing and then move on from there. This is just what I needed to hear. So beautifully crafted! THANK YOU! My focus these four years has been “go, stop, shift direction, go, stop, shift.. etc.” I keep asking myself this; When do we know when to stop; when perseverance kept us bound in one place for too long… and conversely, when do we stay the course when things don’t feel right, instead of pulling up roots… ? Trust. I want to trust and believe that God’s divine wisdom is guiding my inner compass. I just read some good insights this morning in an article entitled ‘Finding A Mission.’ It seems your blogpost on Perseverance and that article Finding A Mission are the key things for me at this moment. What blessings of insights today! Thank you again!! You’re so right- it’s a really tricky question about when to stay the course and when to pull up roots. Watching you navigate things though, I think your intuition is a good guide…and God too of course. Love you friend. Hello. I was trying to contact you on the About page but there’s a glitch in the contact you section – when I try to enter my information and comment it switches to the ‘screen shot’ and doesn’t let me fill in the required fields. Anyways, I have a question about a previous post. I am looking for the story you wrote- I believe in 2014. You wrote about a women who emailed you often, maybe from church, and asked you about your grief. She didn’t avoid mentioning your husband when other people were afraid to bring him up. Her short emails lasted at least a year. I wanted to reread the story but I can’t find it or remember the title. Do you? I have a similar acquaintance who has been so supportive. She emailed me faithfully every week for at least a year after my husband died.I want to write her a note and thank her and rereading your story will help me put my words together. Hi Laura- that’s strange. I’m not sure if I can fix that- but I’ll look into it. I’m glad you had someone do that for you. Yes that’s it! The word I couldn’t remember was steadfast. This story means so much to me. I spent hours looking for it to read (and cry) again. I can’t wait to explain to my friend how much her messages helped me and I appreciate your words of inspiration. Your writings mean more than you will ever know to so many people. It has been my therapy now for years. Thank you from the bottom of my heart.